EXCITING NEWS!!! We have launched unlimited vouchers for our paid members. Are you ready to boost your Amazon sales into the stratosphere? 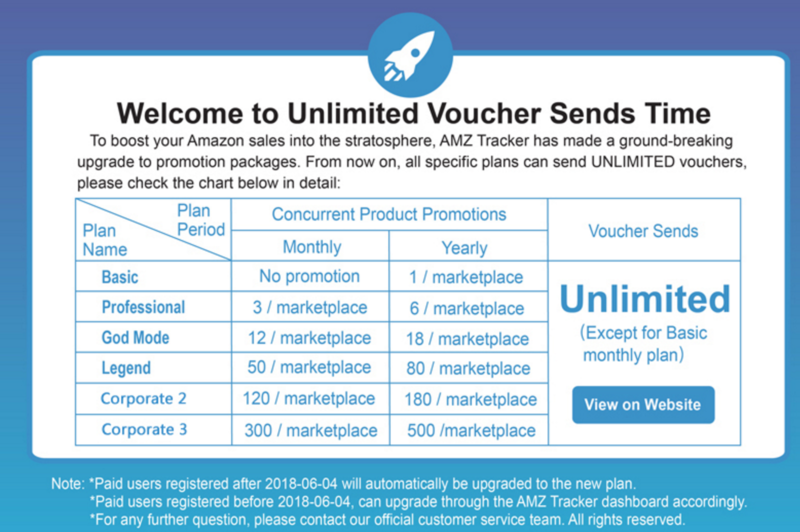 AMZ Tracker has made a ground-breaking change in the way our promotional plans work. From now on, all plans except for our ‘Basic Monthly Plan’ can send UNLIMITED vouchers - isn’t that amazing! If that wasn't enough, we are also increasing the number of concurrent products you can promote. More products with UNLIMITED vouchers mean more value for you, more opportunity to boost your products, and if you are a returning customer, huge savings compared to our old package set up. Don't miss out on this amazing opportunity to multiply your revenue. Learn more and begin dominating your Amazon niche.